Instead of hijacking existing threads, I thought I'd start one here for me and my fellow Amiibo hunters to boast of our latest hunt, share tips and Amiibo news, and so on. So today, I managed to snag Bowser Jr., Olimar, and Zero Suit Samus. Those were the three I set out to get, so I cut myself off there. I COULD have got a Ganondorf and a Dr. Mario, but I had hit my budget. Classic Mario is the only one I didn't see with my own eyes today. Had the best luck at Best Buy. I think it was because they didn't have an exclusive this time around, so nobody had any reason to rush them. I'm hoping they get more creative down the road as far as how they work with games. At least Link unlocked a new weapon in Hyrule Warriors. So the Mr. Game and Watch/R.O.B./Duck Hunt 3-pack came out today at Gamestop. The good news is they seem to have plenty of them, so your odds are pretty good of snagging one if you didn't preorder. The other news is that Mr. Game and Watch's alternate poses are stored beneath each of the 3 Amiibos in the packaging, which makes it seem unlikely that they're ever going to be released individually. Word is a re-release of Little Mac, Greninja, Shulk, Lucario, Fox and Captain Falcon have started being spotted at retail. The elusive Villager Amiibo will be exclusively restocked at Toys R Us on November 8. At some point in the future, they'll also be home to the Mega-Yarn Yoshi Amiibo and the Mii Fighter 3-Pack. I recently saw Little mac at a Toys R us not too long ago. Thanks for that tip! I am now Little Mac'd! Snagged a blue yarn Yoshi from Toys R Us today. Wish I could afford the game that goes with it. Still, it's the cuddliest Amiibo ever. Saw the blue & pink ones today. They had a couple of the bundle ones with green as well. Didn't pick any up though. If I didn't have the kids with me I might have grabbed one for my daughters birthday present. Maybe if you bought less Amiibos? Forgot to post new ones we snagged over Christmas and whatnot. I've taken advantage of quite a few buy one get two & buy two get three deals at GameStop. My son got the Mega Yarn Yoshi for Christmas too. 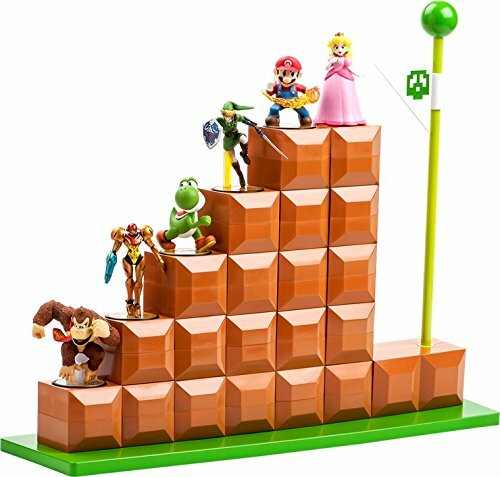 The Mario Bros Amiibo stand thingy is marked down on Amazon from $29.99 down to $9.99! That's pretty tempting!